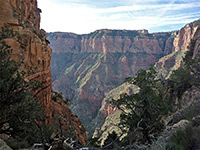 East of Yaki Point and the South Kaibab Trail are several other overlooks along the South Rim Drive before the next path that descends into the canyon - the Grandview Trail, which begins at Grandview Point, reached by a short spur road. This 7,400 foot promontory has fine views in all directions over many side ravines and cliffs around the Colorado River. The trail is narrow, very steep at the first, and only intermittently maintained yet is quite popular, especially the first mile to a viewpoint known as Coconino Saddle, but rather fewer people progress further. 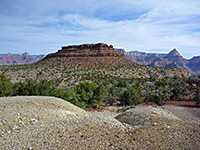 The next target, suitable for a half or full day hike, is another saddle, at the south edge of Horseshoe Mesa, site of some old copper mines, and also the location of a primitive camping area. This place is 3 miles from the trailhead, and 2,500 feet below. From here the Grandview Trail splits into three branches, all descending another 1,000 feet or more to intersections with the Tonto Trail which follows east-west above the river for over 100 miles; unlike the other major paths from the South Rim, the Grandview Trail does not lead all the way to the Colorado River, though this can be reached by difficult, off-trail routes down canyons such as Cottonwood Creek and Hance Creek. Grandview Trail topographic map, South Rim location map. 20 views of the Grandview Trail. 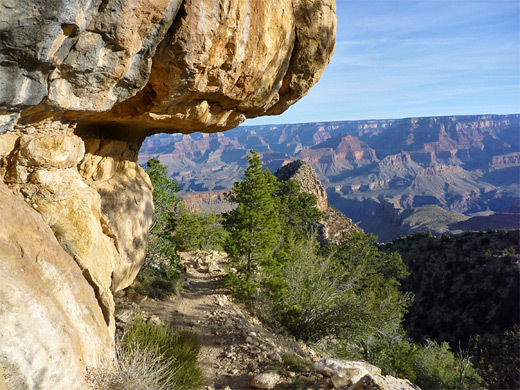 The Grandview Trail is consistently steep for the first mile, starting with a few wide switchbacks down white layers of Kaibab limestone, the floor mostly stone steps or cobbles. A briefly less steep stretch takes the path along a short, narrow ridge, round a promontory and into a little ravine, where it descends via more, shorter, zig-zags; a slippery section, especially when descending. 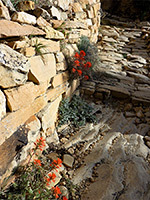 In summer the light-colored rocks are dotted with many wildflowers including bright red Indian paintbrush and bluish-purple prairie flax. A prominent, narrow mesa comes into view ahead and the land opens out a little, giving glimpses of several sections of the route some way below. The trail rounds the inside of a bend beneath a vertical cliff then traverses a little to the Coconino Saddle (1.1 miles from the start); this is a narrow gap between the south end of the mesa and the main South Rim cliffs, overlooking Hance Creek to the east and the upper end of Grapevine Creek to the west. Here a multilingual notice warns of the dangers of proceeding further if not adequately prepared. Beyond the saddle, the path is nearly level for a short distance, following beneath the west rim of the narrow mesa, round a promontory and on to another, less extensive set of switchbacks, also with cobblestones. This section is mostly shady in the morning. After here the gradient lessens as the path moves along the side of the reddish mesa, well away from the South Rim cliffs and eventually passing the north end of the mesa where the land opens out significantly, and a long section of the Grand Canyon to the east can now be seen. Landslides along this stretch have made some parts of the path somewhat precarious and further rock falls seem likely; much of the foundations and supports are unaltered since their construction in 1890, by a copper prospector named Peter Berry. There is a little more gradual descending to the neck of Horseshoe Mesa, where the predominantly red earth (from the Supai Formation) is interrupted by several spoil heaps formed of white rocks flecked with green and blue, evidence of the copper ore that was excavated in this area at the end of the nineteenth century. A sign warns against walking over the piles because of radiation danger. 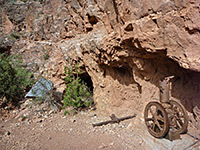 Other relics on the plateau include an old stone cabin, several mine shafts and assorted machinery, while further up the path are many small bands of chalcedony, the same mineral that is found in petrified wood. A 40 site primitive camping site is available for those on overnight trips, on flat land on the south side of the mesa. The plateau to the west falls away to the wide canyon formed by Cottonwood Creek, and one branch of the trail descends here; steeply down a little ravine, northwards for a few hundred feet, traversing a hillside, then steep again, towards the bushy streambed. 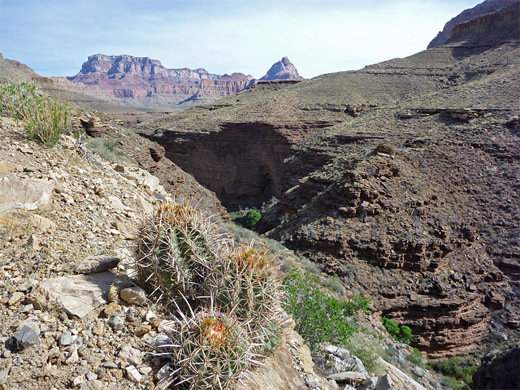 It crosses the creek and a ridge, where a little spur goes to a seasonal spring, then rejoins the streambed and follows this all the way to the Tonto Trail, a distance of 1.9 miles from Horseshoe Mesa. The middle (and least used) of the three continuation paths heads north across the mesa, round the west side of the narrow butte on top and most of the way to the northwestern tip, before a quick descent to the Tonto Bench. To the east, the land is even more steep and the third branch of the trail switchbacks down the side of an upper fork of Hance Creek, zig-zagging across nearly vertical slopes of the Redwall limestone, and moving northeast along the base of a sheer cliff where it passes another old mine site. This is marked by a few pieces of iron machinery and an adit, fenced off but only after about 40 feet, perhaps to allow hikers to shelter in the mouth during inclement weather. 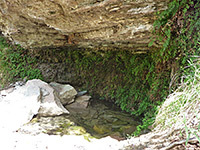 Next is a boulder-covered slope that leads down to the creekbed, and a junction with the 600 foot path to Page Spring (formerly known as Miners Spring), which is a small, permanent, dripping water source that sustains a pool a few inches deep, though no stream. 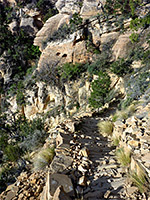 The main trail proceeds along the drainage, now less steep, over a grassy, cactus-studded ridge and onto the Tonto junction, from where the upper end of Hance Creek is reached in another half mile.